Candy Cane Nails! - Polish Etc. Today's mani is inspired by everyone's favorite Christmas candy: the candy cane. At least, I assume that it's everyone's favorite since there are candy canes everywhere around this season. I don't actually like mint so I usually find the Starburst or Gobstopper fruit flavored ones. I've never actually tried a real candy cane. Do you all like candy canes? Maybe I'm just an oddball. Oh well, enough jabber, on to the nails! I started with a base of Zoya Elisa. Elisa makes such a great base color under glitters because it's opaque in one easy coat. I then added two coats of my favorite red glitter: Dollish Polish I Wanna Do Bad Things To You (henceforth abbreviated Bad Things since the full title is a mouthful). Bad Things is a red glitter blend with some holographic red glitter. I got the candy cane look by using a Sinful Colors white striper and free-handed some stripes. I really like how this turned out. If I had tried to tape off the manicure (which I would have preferred) I know that something would have gone wrong because it always seems to for me. Bad Things just glitters like crazy under the opaque white lines and it looks stunning in any light. This one is in the running for my Christmas party Mani! Here's what's in store for the rest of the challenge! I'll be back on Thursday with some snowflakes! I didn't like mint for many years, either. Then one day I just suddenly liked it. Weird. 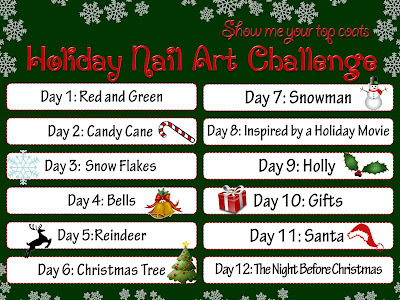 I love your freehand candy canes; freehand definitely makes them look more realistic :) that Zoya is lovely! Love it! I adore real candy canes and most things mint-flavored, and feel slightly betrayed when I pick up a candy cane that LOOKS minty but is actually some odd fruit flavor. So there are real candy cane lovers in the world! This is so adorable! I love the base color! Thanks Jenna, that base is my favorite red glitter, it's just so absolutely stunning. If you ever get a chance to own it, Dollish Polish I Wanna Do Bad Things To You has my recommendation! I hate it when that happens! (Only for the opposite flavor). Go in expecting a particular flavor and it's not right. They do that sometimes with the cherry candy canes... what a horrible experience! Now I'm really careful about smelling them before I eat them now. It's really fun to wear. I got so many comments from people because it's such a distinct pattern!